Dr. Robert Newhalfen is on the cutting edge of treatment techniques. After earning his Doctorate in Chiropractic Medicine he completed over 500 hours of post graduate training in biomechanics, functional rehabilitation and pediatric rehabilitation. Dr. Newhalfen is a Certified Medical Examiner for the Department of Transportation. 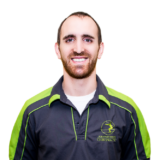 He is a member of the Indiana State Chiropractic Association and Paleo Physicians Network.